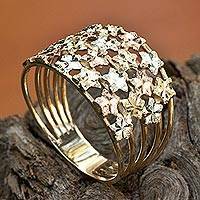 Stars shine brightly in the fabulous design of this band ring from the Biason Family of Brazil. The dazzling wide ring is crafted in yellow, rose and white 10k gold for a spectacular tri-color effect. 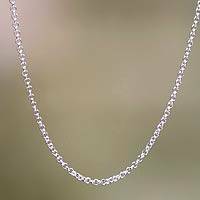 Nyoman Rena presents this elegant cable chain, perfect for a favorite pendant. The necklace is crafted of sterling silver with a polished finish and a lobster claw clasp. From Komang Wijayana, these earrings captivate with Balinese elegance. The earrings are crafted by hand of sterling silver with oxidized contrasts. From Wadarat Supasirisuk, these delightful earrings suggest a lace evening bag. 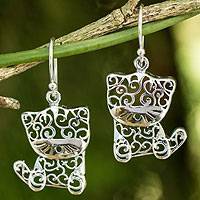 They are carefully crafted of sterling silver filigree. Crafted by hand, petite fig leaves reveal fascinating textures. The sterling silver forms are bathed in 18k gold, and grace modern Thai drop earrings by Srimuang. Crafted by hand, petite sterling silver blossoms bathed in 18k gold reveal fascinating textures. The flowers dance on modern Thai earrings by Srimuang. Crafted by hand, petite blossoms reveal fascinating textures. The sterling silver flowers dance on modern Thai earrings by Srimuang.